In typical family fashion, my dad and I finished that first half of the beam and promptly got distracted with a different porch project. I had been wishy-washing over whether to build a deck over the ugly, badly-laid tiles, but while my folks were here, a deck just seemed the logical thing to do. What with the foundation and sill plate guys still hard at work, we were restricted to working on the porch pretty much; and anyone who has tried to manipulate multiple pressure treated 10- and 12-foot beams knows it’s just easier with two people! 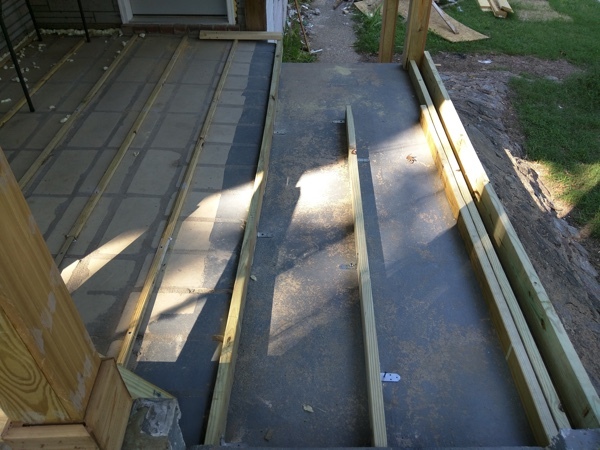 We spent probably three whole days just planning, planning, and planning – it was really difficult given that each tile had a different height and both separate levels of the porch sloped in two – and even three! – different directions. I should show you the dozen drawings we made…. the half-pad of graph paper we used up – or maybe I’ll spare you. Long story short, it took days and days to plan, but only one day to lay, screw in, and shim the initial furring strips. 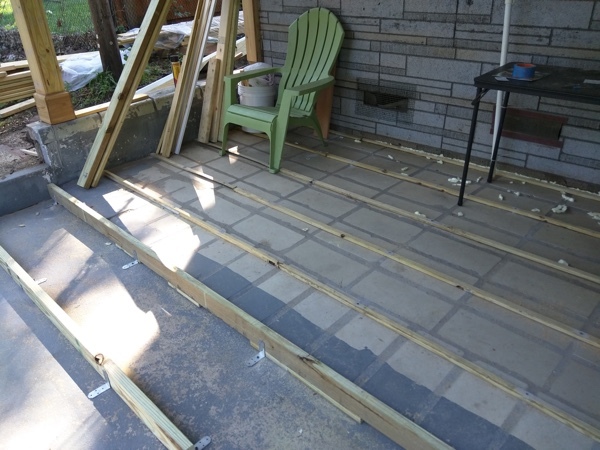 The next day we laid, shimmed, and anchored the 2x4s that run across the lower part of the porch. After many frustrating hours with my little bottom-end battery-powered Porter Cable, my dad splurged and bought me an early Christmas present. It’s battery-powered, which is nice because I’ve learned I will put projects off indefinitely if I have to daisy-chain extension cords in order to do them. So it’s not as powerful as the corded one my neighbor lent me, but it’s much more powerful than the one I had before. And it can do the smaller 5/32″ holes, which my neighbor’s couldn’t get down to. I drilled a series of holes in concrete in an average of maybe 15-30 seconds each- soooooo much nicer. This entry was posted on Thursday, August 10th, 2017 at 4:54 pm	and is filed under rehab. You can follow any responses to this entry through the RSS 2.0 feed. You can leave a response, or trackback from your own site. Atom, Entries (RSS .92), (RSS 2.0) and Comments (RSS 2.0). 26 queries. 0.241 seconds. Top.